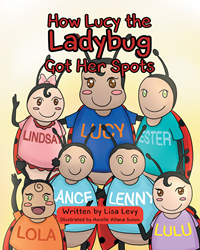 Recent release “How Lucy the Ladybug Got Her Spots” from Page Publishing author Lisa Levy and illustrator Axielle Allana Suson is an exciting story about an inquisitive ladybug named Lindsay who visits her grandmother to find out how her mom has gotten her beautiful spots. Lisa Levy, a proud mother and grandmother, ladybug enthusiast, and creative writer, has completed her new book “How Lucy the Ladybug Got Her Spots”: a fascinating short story of a ladybug’s well-spent day of baking and eating cookies with her grandmother, the one who can answer her question regarding her mom’s spots. This is the second book Lisa has published. To find out more about her first book, “Ladybugs to the Rescue”, please visit http://www.pagepublishing.com/books/?book=ladybugs-to-the-rescue. Author Levy incorporates moral values in the story by presenting Lindsay the Ladybug as a helpful granddaughter: Afterward, Lindsay hopped up and put all the dirty dishes in the sink with warm bubbly water to let them soak, while she swept the kitchen floor. Published by New York City-based Page Publishing, Lisa Levy’s memorable book turns story time into a more fun experience for the little ones. Through Lindsay the Ladybug, readers will learn to be respectful, be helpful with household chores, and be more observant to the things around them. Readers who wish to experience this remarkable work can purchase “How Lucy the Ladybug Got Her Spots” at bookstores everywhere, or online at the Apple iTunes store, Amazon, Google Play, Kobo or Barnes and Noble.